The IBM Eserver zSeries® 990 scalable server provides major extensions to the existing zSeries architecture and capabilities. The concept of Logical Channel Subsystems is added, and the maximum number of Processor Units and logical partitions is increased. These extensions provide the base for much larger zSeries servers. 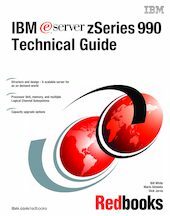 This IBM® IBM Redbooks publication is intended for IBM systems engineers, consultants, and customers who need to understand the zSeries 990 features, functions, availability, and services. Note that the information in this book includes features and functions announced on April 7, 2004, and that certain functionality is not available until hardware Driver Level 55 is installed on the z990 server.